10 Books That Screwed Up the World: And 5 Others That Didn't Help seems like the type of book to review on April 1st. Somehow. If you have a sarcastic and somewhat twisted sense of humor, that is. But let's not go there, ok? 10 Books That Screwed Up the World indulges so many of my thoughts. It plays off of my strengths and my weaknesses. I liked it entirely too much. I saw the title and immediately I thought, "I MUST read this book!" It wasn't a "oh, I should read that book . . . someday." It was a "I MUST read this book NOW!" 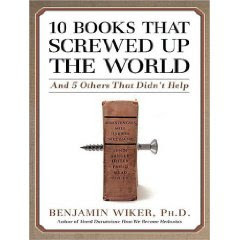 Benajamin Wilker, Ph.D. is the author and his basic premise is that ideas have consequences. Based on that belief, he talks specifically about ten books whose ideas had far reaching consequences and not all together positive ones. He writes from a politically conservative position and that of a Christian. That said, there are a lot of people out there that wouldn't agree point blank with his conclusions, although I myself think they make sense. Imagine that I'm giving you a playful slug on the shoulder as I say, "AWW, come on! Just read one chapter! It won't kill you." And then I grin mischievously and laugh a goofy laugh. That's about how I feel about this book. It's playful good fun (to me) while being completely and utterly serious. Wilker hits on Machiavelli's The Prince, Marz & Engels's Communist Manifesto, Darwin's The Descent of Man, Hitlers Mein Kampf and Kinsey's Sexual Behavior, among others. Wilker does not argue that these books should be banned. On the contrary, he says that they ought to be read because they ARE so influential. Only he wouldn't suggest that you read to agree but read to understand where the flaws are. Again, it's all back to ideas having consequences. Darwin prompted eugenics with his book and Hitler laid the course with his. Ideas can take you places and Wilker reminds us that we shouldn't take that for granted. On the contrary, words can wield great power and we need to be aware of what people are saying and thinking so that we can respond appropriately. I thought this book was well written and well thought out. I highly recommend it for a good time and a deep thought (or two or three). It's a worthwhile read AND a worthy read if it makes you think for one second that what YOU say and do will also matter. Because it will. That is a great title. I probably wouldn't be able to resist it, either. And another book goes on the "get my hands on.." list! I heard the author interviewed on the radio, ran out and bought it but couldn't get into it. My fault, definitely not the author's. I think I will try the audio version. It sounds like you and my dh are "in sync" w/ the books these days. He just got done reading this one, too! :) It's on my list to read...when I finally get done with Three Swans! This is going on my list! I looked, and there's three there that you recommended...you're so not helping me make the list smaller! I've read Communist Manifesto and definitely think it's a must read BECAUSE of it's influence. Intriguing! Might have to go and find this one. I just read a book by this guy and Jonathan Witt, called A Meaningful World, which I thoroughly enjoyed. This book looks good too. I like how they have Descartes on the list. He's not usually on lists like this, but I've heard he created lots of enlightenment trouble. Reading the comments that have been posted, I wonder where the dissenters are? Have they been cleansed as part of a marketing campaign, or has everyone simply drunk the proverbial kool-aid? Wiker is very good at summarizing these works, and if you want to get a very quick and slanted overview of these books, well this is the book for you. The most disengenous part of the book is that he claims (he is a Platonist in Christian clothing) that he is practicing philoosophy while these others are practicing rhetoric, imposing their world views on us like so much DDT spread on the weeds of godlessness. Of coourse, any philosopher worth his or her salt will see him and Socrates coming a mile away. Had he simply taken issue with the atheism in each work, and even the inherent humanism of each, it would not be so bad. Where he becomes down right pedantic and dishonest is when he begins to beat the drum of the right to life and fall into line with his right wing followers who hope to someday return women to the kitchen to stay. Be careful of those who do your thinking for you folks... and be careful to see Dr. Wiker coming! Anonymous, I would hardly charge Dr. Wiker with placing women in the kitchen; I would also disagree with his pro-life agenda. Where the genius of his book lies is how he is able to show how one’s thinking can cause genocide, sadness, sexual perversion and what thinking can correct that. Some people call this corrective thinking Christianity, pro-life ideology and conservativism. Yet now this becomes a mere game of semantics. Rather Dr. Wikers book is well balance and very intriguing. One cannot help but think of how these books have influenced people around them and how the confusion these books propagated still remain with us. Have you ever wondered why this world is so messed up? Why there is some much killing? Why people treat others like machines rather than humans? Where our family values have gone and why extreme feminism does not achieve the happiness and fulfillment promised? This book will point you in the right direction. I say buy this book for the youth in your life and for your "enlightened" friends and family.